How to add my local business shop on Google map? How to create a listing on Google My Business? How to grow my business on the web with Google? How to optimize your Google My Business listing on top ranking? Can I use a residential address for Google My Business? What are the free local listing in Google? How do you add my local business shop on Google map? How to promote my business in less time? How to get a company name in Google Search? How much does it cost to post my business on Google maps? What are the benefits of Google business listing? What is a Google verification code? How to rank my business on Google? Which SEO tactics improve rankings in a local search? How to get by business listed on Google? What is your review of Google Express? Google My Business is a free service that helps local business stand out on Google Search and Google Maps. You can manage a business listing online including business category,contact details, business description, photos, posts, reviews, website link and phone link. Sign into Google My Business at google.com/business. Login with your Google Account or create one. Enter your business information such as name, business type, telephone and location. Verify your entry using phone, email or mail postcard. Enter your verification code to your Google My Business listing. This listing will become live across Google. 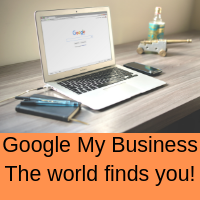 Create a Google My Business listing at google.com/business Your business location including GPS coordinates is recorded. Your business categories are recorded. When someone searches for your types of products and services in the local area your business may be the closest matching result. This is on Google Search and Google Maps. Users can ask for directions straight from their smartphone. Google My Business can be found at google.com/business. There is also a Android and iOS app. Login with your Google account or create a new one. Enter your business category, name, description, address, open hours, phone number and optional website. Verify you location using phone, email or postcard. Enter your verification code to your listing to make it live. Add pictures for the logo, cover and additional images like products. Posts last 1 week on the listing. Use customer keywords in your writing. By creating a Google My Business listing you clarify your business location. This helps with local search and showing your business in Google Map searches. If you have a website link then a backlink from Google #1 website is very valuable. Once a customer can see your listing they can learn about your business, view pictures, see open hours, see posts, see reviews, click to call your business, get directions on how to get to your business or interact with your business website. Your customer awareness and trust has already been improved before they purchase. Keep your Google My Business current and accurate. Listings with picture have more interactions. Use customer keyword phrases in your text. Add a post once a week. Respond to customer reviews regularly. Once your listing is optimal you can add Google Adwords Express ads. Here you can write heading line, 2 ad description lines and URL link ads. Set up ads for your product and service categories. You set the radius distance around your business for customers and set a budget. Google matches search queries to you business categories and ad text. You can have top ranking with call to action of calling or visiting your website. A Google My Business listing is free and can drive prospects to your business. You get monthly emails on how many times your business Google Map pin is shown, how many pictures were viewed, how many calls were made to your business, how many times directions were used to get to your business and how many clicks to your website were made. This is free digital marketing. From Google My Business you can create a very basic website and use Adwords Express for ads. Once your ads are created you set a budget for how many prospects or customers you want per day. This works out like a few dollars per new client. Yes. There is a checkbox yes or no question, I deliver goods and services to my customers at their location. You can also set a delivery area radius around your business in miles or kilometres. Yes. If your customers are in the local area then local links help your website. Add Google My Business and Bing My Business listings for. Include your location in the footer of web pages. Provide local content and images. Try to be on local business directories with website address. Gain testimonials from local people. Drive social media engagement with local news events. Local links relate to local authority and relates to local website traffic. Google My Business is a free business listing service. It use to be called Google Places for Business. The listings have been moved to the new system. Show your business name, description, phone number and website address to local Google Map searches and local Google Searches. You get a monthly email on your listing analytics performance. Visit google.com/business. Authenticate with your Google account or create a new one. Fill in your business details. Anyone can fill in the initial information. The business manager or owner, verifies your location using phone, email or postcard. Enter your verification code with your listing. Your business listing then live. The Google My Business listing can have multiple people associated with it with the roles of Owner, Manager or Communication Manager. Google My Business and Bing My Business both allow you to list your business for free. Your business can then show up in local Search Engine searches and local Map searches. A Google My Business listing can be completed in one day if you use phone verification. It is then free marketing. The listing can drive map views with your business, website clicks, phone calls and smartphone map directions to your business. An example of this is a local Kindergarten which generates enough interactions from Google My Business to keep full occupancy. Once a free Google My Business listing is created with business category, business description, business location and business website you can appear in local Google Search. To boost your position to the top you can add Google Adwords Express for paid ads. Try to match customer search phrases with text in the ads to improve ad visibility and performance. Google My Business listing provides your business with Google Map business pin views, Google My Business listing views, picture views, customer awareness of your business, phone number link, website link, smartphone direction to your business, customer reviews, posts and instant messaging customer options. Your Google My Business location is used by Google to influence local search for your category of products and services. There is an option to make a very simple website with your listing if required. Google Adwords Express lets you create paid ads with text and have automatic matching by Google. You only pay for clicks or calls. Once you have entered Google My Business listing information, you need to verify your location. The simplest methods is a phone call to your business. Google calls you and announces a 5 digit code. You enter this verification code into your listing to make it live. An alternative is to have a postcard sent to your business address that has the verification code on it. This can take 2 weeks. Log back into google.com/business and then enter your listing verification code. Create a website. Register the website domain name on your Google Search Console. Create content and build a sitemap.xml file listing all your web pages. Social media share the new content. Register this sitemap.xml with Google Search Console. It may take a week to review and index your good content. For a physical business, create a Google My Business listing, which helps with local search and local map search. A Google My Business business listing confirms your business location and business categories. When a Google search is performed in the local area looking for products and services from you category then you can appear as a search result. You business may appear on a map with a simplified version of your Google My Business listing below. A click on your business will show the full listing. Having content that relates to their exact search phrase will improve your search engine result position. Go to google.com/business. Login with a Google account or create one. Enter your business details. Verify your business location. Your business can now appear on local search and local Google map searches. Google Adwords Express is a simple form of digital marketing sitting on top of Google My Business. You write a ad title, 2 line description and URL link to your website. The call to action can be a phone call or a link to your website. You only pay for clicks and calls. Your Google My Business listing business categories, ad text, search location, search phrase and business location is used to show ads to the appropriate local people. You set a region and daily or monthly budget. New clients cost a few dollars each. This is much simpler than Google Adwords as there are no keyword phrase lists to maintain. It is designed for small to medium business without a marketing expert.